Da S > D : (in piedi) Teresa La Valle, Sibilla Malacrino, Serena Leone (semi nascosta) e Jenny Vafopoulos. 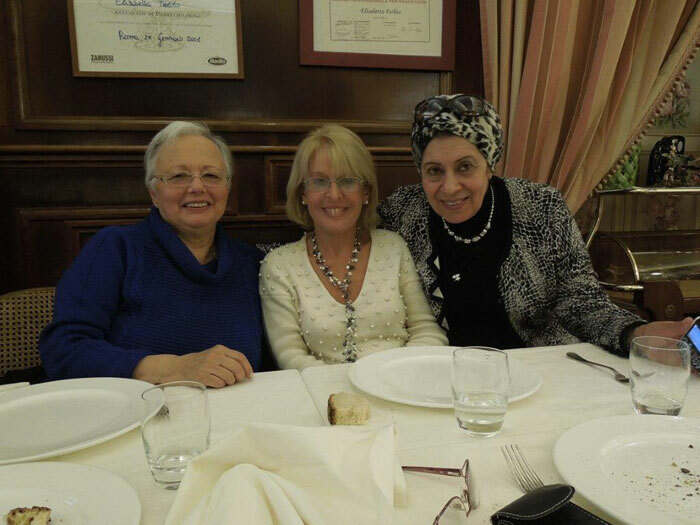 As you all know finally after 50 years we met with Magda Abou Youssef, in Rome. Eliana had tried for a very long time to get us all together and it is all thanks to her tenacity that it all came about. 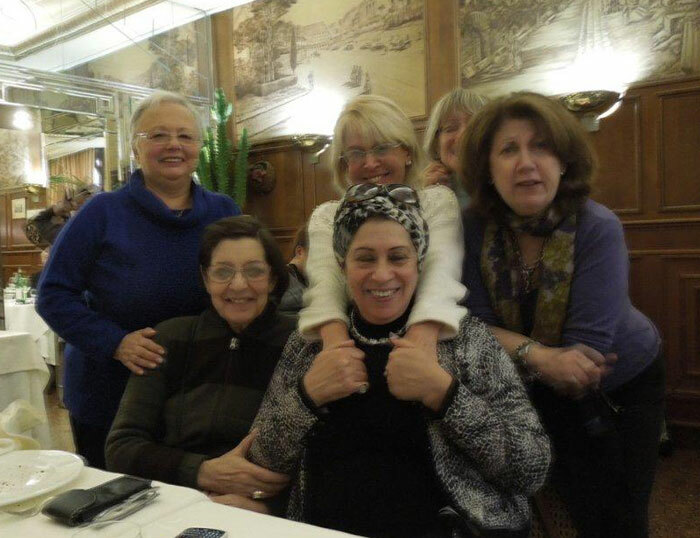 The date was set Monday 7th January: Magda en route to Germany was flying in from Egypt with her brother, Eliana and Serena were taking the train from Milan and I was flying in from Heathrow. Magda’s nephew very cleverly had found a B/B on the Piazza della Rotonda i.e. the Pantheon very central indeed, where we all stayed. Upon my arrival at Termini feeling fed up with travel I took a taxi to the Pantheon and to my surprise I found ‘Les Girls’ looking for me round the Piazza.The number we were given for the B/B was wrong……and it took them some time to discover the correct one: 70 and not 60!!!!! And now all three of us were waiting with great expectations Magda’s arrival. We were very excited at the prospect of this reunion –we felt just like before our picnics to Montazah-mischievous, playful and anxious vis à vis the outcome. Well my God no one would believe it – lucky we have the testimony of Sherif (Magda’s brother ) –when there was a knock on our door and there on the threshold stood ‘our Magda’ of 50 years ago with her brilliant smile and warmth exuding from her persona. The hugs, the screams, the kisses and the tears, suddenly a magic wand had brushed all those years and we were transported in our youth and carefree selves in another world. It was very very emotional to say the least ……talk, talk, talk and more talk nothing could stop us. And then came the laughter when Magda told us that her son in law had asked: why on earth all this excitement to go and meet some geriatric friends of yours!!!! !Ha ha how he underestimated us .That evening we all 4 went out to dinner in a lovely restaurant called ‘El Faciolaro’ close to the hotel and recommended by Rita, Eliana’s Romana friend. There too, talk was “de rigueur” as we were trying to fill in the gaps of so many years in our respective lives. The next day, Magda came into our room immediately after breakfast, saying we should go off on our own, but Sherif,her sister in law and her nephew wanted to join the party!!!!! We did not have the heart to leave them on their own. So we all left together on one condition, that they will follow at our pace and NOT GET LOST. The idea was sight-seeing, with me the guide, and meeting for lunch at the Fontana di Trevi ,with Sybilla and Teresa La Valle at 1 o’clock. First stop: The Pantheon, of course, on our doorstep from there we proceeded to the Piazza Navona, having passed Giolitti ,which reminded us of Athenaios and Delice in Alex of long ago; Palazzo di Montecitorio which is now the Chamber of Deputies with the Column of Marcus Aurelius and his campaigns against the Barbarians carved on it. Piazza Navona is unique as she owes her shape to the Roman stadium not to mention the fountain of the four rivers, Bernini’s masterpiece. Then we continued past the church of the Santi Apostoli en route for the Spanish Steps where we stopped for coffee at the Caffé Greco (opened by a Greek in 1760). There we were given a review of Alex over the years by Sherif ,which was marvelous. Second stop: Fontana di Trevi the most theatrical design ever. There we met with Sybilla and her sister and also Teresa. They had chosen a lovely old fashioned restaurant close by, the Quirino where I ate the best lasagna con frutta d mare ever!!!!!!! The atmosphere was electrifying for once again the interim years vanished and conversation took up as if from yesterday. The brio with which all talked at once transported us to our youth and in our school days. After lunch ,Sybilla invited us to drinks at her house and afterwards to go to dinner at a restaurant near her. We left it open for we did not know how tired we would be after the afternoon sight seeing?????? This was a very wise decision: for we continued on foot towards Piazza Venezia, then Trajan’s column, all the way up the Fori Imperiali to the Coliseum, where we collapsed …..It was ca. 4pm and Sherif suddenly said we must go to the Vatican. I did not have the heart to say No but I said we ought to go by taxi otherwise we will never make it. Duly two taxis were hired and off to the Vatican, past Castel Sant’Angelo and up the Via Conciliazione to the colonnaded piazza san Pietro: the Xmas décor was still in place, the Tree and The Manger, full of people but it did not take us very long to go into St. Peter’s. This was the first time for all the Abou Youssef family. We stopped by Michelangelo’s Pietà, then the tomb of Christina of Sweden, St. Peter’s 13th cent. statue by Di Cambio and of course Bernini’s Baldacchino which is a baroque extravaganza at which only the Pope celebrates mass. After almost 2 hrs there we took one large taxi which contained all of us back to the Pantheon. All the others were exhausted but the geriatric group decided to decline Sybilla’s kind invitation, and to go for a Pizza round the corner. We celebrated our last evening together en fille at the Pizzeria dell’Anima where we stayed past 11 pm. Our conversation centred round our next meeting which we hope will be in Berlin in May Inchaalah. Next morning 8.30 we were all up to bid the Abou Youssefs good bye. More tears more laughter all our emotions were very raw for we did not really want to part soooo soon and let this dream come to an end. That morning after Magda’s departure Eliana, Serena and myself went for a little shopping and walked up to Piazza del Popolo, having beforehand visited the church of Santa Maddalena, the only rococo church in Rome and San Agostino, where we saw the most beautiful Caravaggio of The Virgin with Rita and her husband. Lunch was a tavola calda, on the Via del Babbuino, directed by our noses which turned out to be excellent. In the .afternoon we met for drinks with a friend of my brother’s from British Boys School, Alec Saccal, who was fascinated by our tales of Alex and our friendship with the Abou Youssefs ,because guess what?????? Magda’s brother Mamdouh, my brother and he were not only friends but in the same football team at the school, something I did not know and I am still awaiting pictures which my brother promised to send me confirming this matter. What a wonderful surprise to crown our dream. Eliana, Serena and myself went back for dinner at the Faciolaro slightly sad as we were missing Magda already. Thursday 10th the girls took me to Termini, where I took my shuttle for the airport and where they boarded their train to Milan half an hour later. All good things have to end but in our case it is only the beginning, of more encounters in store, for as long as God will give us strength and longevity. Our youth is still there waiting to kick in.